MAGIX VEGAS Movie Studio 15 allows you to create pro-level videos complete with effects, titles, transitions, and specialized plug-ins. VEGAS is known for having more audio tools than many peer applications, nevertheless Movie Studio 15 also comes with MAGIX Music Maker audio production software, which will let you apply additional levels of creativity to the music and audio in your projects. 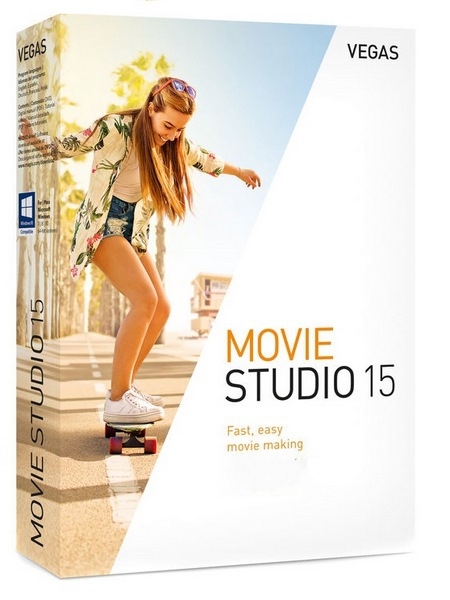 VEGAS Movie Studio 15 is compatible with Windows and requires relatively minimal hardware. The application supports up to 10 video tracks on the timeline in standard definition, HD, and 4K resolutions. Movie Studio 15 provides tools to easily edit your videos and enhance them with features such as Crop, which allows you to cut out any part of an image you don't want and to keep the rest. True to its VEGAS legacy, Movie Studio 15 has a drag-and-drop workflow and the ability to handle various file types on the same timeline.